Congressman Ed Perlmutter joined President Obama’s visit to Cuba, where the American president laughed and back clapped with the murderous dictator Raul Castro as the two of them took in a baseball game just hours after the latest terrorist atrocity to hit the West. Before the first pitch, Obama and Castro participated in a joint press appearance, where Obama was humiliated by Castro, as the dictator lectured Obama about human rights. 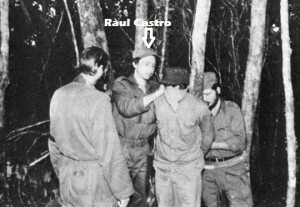 Pay no attention to that photo showing Raul Castro personally participating in a firing squad execution of a political rival. If only America’s leaders had the same “flexibility”, amirite President Obama? “It’s very exciting,” remarked a starstruck Perlmutter about the trip during a phone interview with the Denver Post. Raul Castro participated in hundreds of extrajudicial murders of political opponents during the bloody communist revolution orchestrated by his even more murderous brother, Fidel. The brave Cuban Air Force was tasked with attacking rafts and small boats trying to flee the island. Castro’s military stole businesses all across Cuba, and built 200 prisons to house anyone who might object. On an island impoverished by decades of communism and political oppression, Perlmutter was excited to attend meetings about…(wait for it)… renewable energy. Yes, that is just what a destitute third-world country needs: windmills and solar panels. An electrical grid might be a good start. Most parts of Cuba still endure regular, localized power outages because of the island’s aging power grid. But hey, how could he resist the chance to join Obama, and all of the trappings of the presidency, on a trip to visit one of the last surviving communist dictators?